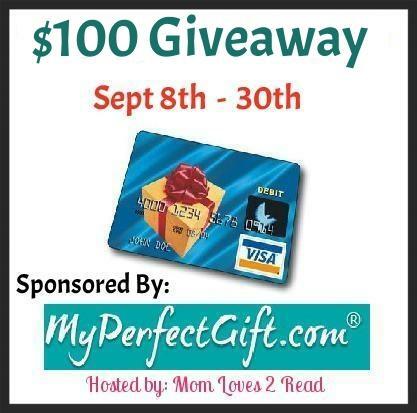 Mom Loves 2 Read has teamed up with MyPerfectGift.com and an amazing group of bloggers to bring you this fun giveaway. MyPerfectGift.com is a great website where you and your family members can register for free and set up a personal wishlist. It's so easy you can even use facebook to login and register! My Perfect Gift has nearly anything you could think of to add to each wishlist. You, your spouse and even your kids can all make their own wishlists to share! If you already have a MyPerfectGift Registry just add a new gift to your existing wishlist. Entries will be validated using Winner's email he/she registers with. $100.00 Amazon.com or Visa gift card! Enter using the GiveawayTools form BelowHave FUN! Disclaimer: Disclosure: To be eligible to win this giveaway you must create an account and add at least three items in your registry. If you have an existing account add at least one new item to your registry. Mom Loves 2 Read did receive compensation for this giveaway event, however my opinions are my own and may differ from yours. (Living As We) is not responsible for sponsor prize shipment. This giveaway is not associated with facebook, twitter or any other social media. Prizes can take up to 8 weeks to arrive. Void where prohibited. Added an Amazon Giftcard, because giftcards are always the best gifts! M&M Meat Shops Invites You! Spa For Ma Giveaway Hop!